Home»At home»Have you got an emergency grab bag? Have you got an emergency grab bag? Whether you have to evacuate your home due to flooding or as a result of another emergency you may need to leave it quickly. You’ll probably want to take a few necessities with you. Have you considered preparing a small easy-to-carry bag with essentials and store it in an accessible place ready to go? 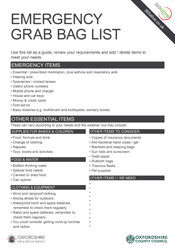 Or making sure you have an up to date check list for things to put into your emergency 'grab bag'. 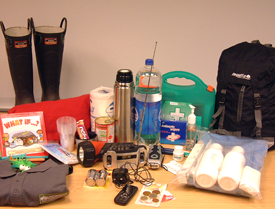 The bag contents will vary depending on your needs but here are a few suggestions from our Emergency Planning Team.